Men's Felt Wide Brim Fedora with Recycled Trim Patchwork Band -- Velour Felt Finish. Photographed is Black velour with hints of color on band. This felt hat is made of the highest quality of materials. Soft to the touch and comfortable to wear. 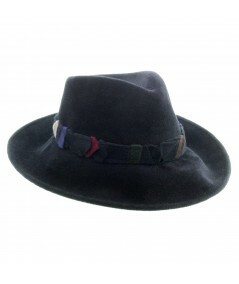 Our men's hats are not as stiff as other hats on the market. The band is edgy and modern with a bit of color. This felt is made of rabbit hair, a by-product.